“Showman” skyrocketed Settle into the spotlight, and Hugh Jackman, who leads the cast at P.T. Barnum, has touted Settle’s contribution at every step of the movie’s press tour. He even posted a video on Instagram encouraging fans to purchase her first EP, “Chapter One,” which was released in January. But Settle didn’t think she would end up on the big screen with the film. While she had been involved with early readings, she never considered that she would continue with the project, as films are often loaded with A-listers. Also, the vocally ambitious “This Is Me” was not part of the score until the final workshop, which was for the Fox executives to decide whether or not to greenlight the film. On the day of the reading, Settle cowered slightly behind the music stand, her voice soft. Then as the song crescendoed, she pushed the stand away and started riffing and belting. At the end, as the tempo slowed, she grabbed the hand of a teary eyed Jackman, and when the song kicked back into high gear, Jackman pointed to the sky and stood to dance. “I said to myself, ‘Well that’s a lie,’” Settle remembers. They called two months later and suddenly it became real. Like her character in “Showman,” a bearded woman working as a laundress before being plucked for stardom by Barnum, Settle has her own rags-to-riches story. 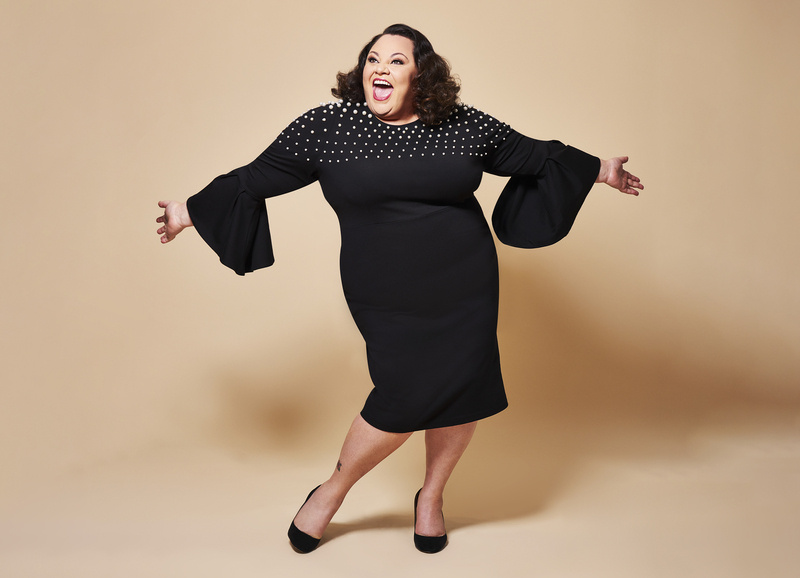 She started her career as a standby for Tracy Turnblad in the national tour of “Hairspray” in 2003, but moved back home to Hawaii, worn down by the grind of a show production schedule. She also knows what it means to be in the shadows, as she worked backstage at California’s La Jolla Playhouse and the Old Globe in San Diego as a stagehand. Settle spent many years afraid there wasn’t a place for her in the industry, but in 2013, she landed onstage in “Hands on a Hardbody,” first at La Jolla and then on Broadway, and earned her first Tony nomination. Since then she has been consistently treading the boards in “Les Misérables” and “Waitress,” carving out her own niche in the business. She pulls from moments like that and from feeling like an outsider in her performance of “This Is Me,” which she finds difficult to perform even now. Now, “This Is Me” is nominated for an Oscar, and come Mar. 4, Settle will perform on her biggest stage yet. So is she nervous? “It’s the same song,” she says, nonchalantly. Fans of “The Greatest Showman” see Settle as an inspiration. She often finds herself in tears scrolling through Instagram, where she receives countless messages from people who have been affected by the song’s message of accepting who you are and harnessing your own power.